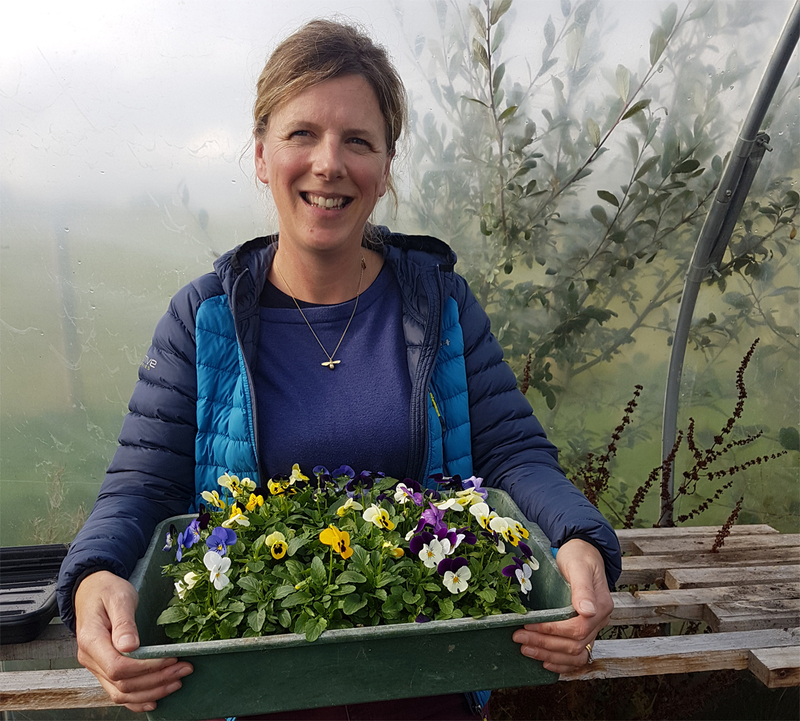 Sarah Hughes runs her business, Eat My Flowers, from the family farm at Cae Mawr where she lives with her husband, Philip, and her two teenage boys. Whilst Philip works for the Rhug Estate, and with his father on their beef and sheep farm in the Dee Valley, Sarah set up her business in 2011 when she saw an opportunity to diversify, improving her work/life balance. Sarah grows edible flowers that she crystallises for cakes and patisseries. “I used to be a small business advisor for the Welsh Government. I did that when my children were very small. But when they went to school, I had to find work that would fit in with school and the farm. “I looked at various potential businesses and did a lot of research. I looked at holiday lets and other things. Then, whilst at Rhug, my husband helped set up organic meat farms for the high-end restaurants in London. But Sarah had the idea of making crystallised flowers when a friend suggested flowers Sarah had painted for an Easter cake might be a good business idea. By crystallising the flowers and painting them in egg white and sugar, the shelf life could be vastly extended from just a couple of days to months. “I had already done the research for the business when I was looking at edible fresh flowers,” she said. Sarah grows violas, primroses, and roses in her polytunnel at her home. Once the flowers have been crystallised by hand-painting them with egg white and sugar, the flowers are sold to businesses across the UK where they’re used for cakes and patisseries, or she uses the fresh flowers for her handmade flower lollipops. Sarah has contracts with both Harrods and The Berkeley Hotel in London and also does a lot of work for corporate events. “It has been a fantastic business,” she said. “It’s very flexible. And I know I’ve grown everything myself. There’s a lot of personal fulfilment. Through horticulture, I have travelled to places like Dublin and Dubai. There’s a lot of support from the Welsh Government when you produce food. It’s nice to show you can grow something on a small acreage, and I do make a living.